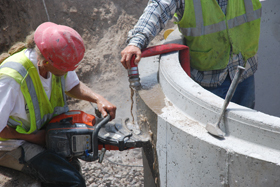 The Watershed Center, in partnership with the City of Traverse City, installed a new runoff filtering system at Bryant Park during summer 2012. The new system has a series of tanks to remove trash and sediment before the water enters a large underground filtering system. This system is a series of chambers directly under the sandy beach area where water will filter into the soil. Bacteria, oils, grease, and other pollutants will be broken down naturally by microbes in the soil. A significant portion of the runoff will be directed to the new filtering system, which will reduce the amount of pollution reaching the Bay and reduce pressure on the system so it won’t overflow onto the beach. The Watershed Center has been testing Bryant Park’s E. Coli levels once weekly every summer since 2001. E. Coli levels have historically been higher after a rain. Recent testing on runoff in storm drains has confirmed this. E. Coli in the runoff is likely due to animal feces in the storm drain system, such as pet waste from yards, raccoons living in the drains, and other animals such as deer. Further, due to increased development and poor historical design, runoff from the surrounding city streets was frequently overloading the old system, forcing it to blow its top, which was located directly on the beach. Runoff would then wash right over the beach and erode a large amount of sand directly into the Bay. 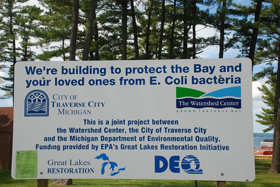 The project was funded by EPA’s Great Lakes Restoration Initiative through the Michigan Department of Environmental Quality.